This week we welcome Green Fins assessors Jaya and Martheen to our resort, they spent a day with our team assessing our operation, diving with us and providing us with valuable training to ensure we succeed in our goals and continue on the right path with our efforts. As part of the Green Fins evaluation process, they assessed us against a strict criteria , dive with our team to experience first hand our briefing and how we conduct our Watersport activities. They toured our facilities to check our environmental impact and solutions. They interviewed us and completed their on site evaluation. We are proud to announce another amazing milestone for our eco-friendly PADI 5* Dive Resort. It is no secret that over the past 3 years, our team has worked extremely hard to ensure that our dive resort, our employees and our guests leave little impact on our environment, ocean planet and the island of Nusa Ceningan. In our efforts, we eliminated plastic straws and plastic bags from our bar and restaurant. We stopped selling water bottles, instead offering free refill water stations around our resort. We reduced and eliminated the use of single use plastic containers and armful chemicals. Promoting eco-friendly options to our guests during our arrival briefing at the resort and focussing on ways to reduce our water consumption and waste management. We teach our guests, students and team to respect the environment and focus on low impact eco-tourism solutions. Many of these projects were spearheaded by Victoria (who has moved on to greener pastures) and Robert (Ceningan Divers co-founder and Director). Robert has been an active voice on various environmental issues for more than 25 years. From participating in the year long S.A.V.E Tour (Student Action for a Viable Earth) in 1992, his work at Greenpeace in the mid 90s, technology consulting with leading NGOs in the 2000s, as a panelist with Elizabeth May (Leader of the Green Party of Canada) at the 2010 sustainability submit on the Deepwater Horizon disaster, co-organizing some of the largest fundraising efforts for Project AWARE since 2012, or speaking on low impact tourism and the challenges of operating an eco-focused business at ADEX. It is clear from our background and team efforts, we are passionate about what we do. Our team has worked hard to get our various initiatives around our resort and dive operation running. We push ourselves with each new projects to achieve our goal of operating a sustainable eco business. We still have some ways to go. 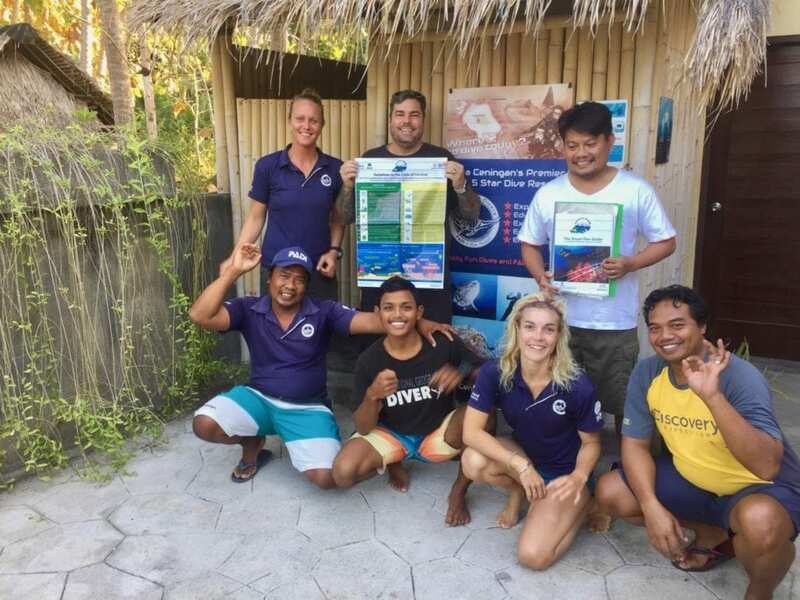 As part of our next set of goals; we aim to be more active with local reef check programs, host regular cleanups on Nusa Ceningan, and push training programs by collaborating with other operators to help educate, promote sustainable solutions, improve our local environment and help ensure our world-class dive sites remain sustainable for future generations. Our team will continue its hard work, we still have many projects in the pipeline, our eyes set on new challenging goals. We hope to implement several new solutions before the end of the year and throughout next year. We will continue to improve our facilities and offerings to ensure we provide our guests and students with best-in-class eco solutions at our PADI 5* Dive Resort. More on these projects in the coming months. As part of our Green Fins Code of Conduct, our team will be delivering an even more detailed briefing on our potential impact and how we can make a difference. Around the resort and prior to diving our guests will have access to our Green Playbook with valuable information for them to read and learn. We will add new information on our website and social media to promote Green Fins initiatives and support others who wish to become Green Fins Operators. We will be working with other operators and educators to bring new offerings and solutions. We are in the process of hiring our newest team member, who will be tasked with coordinating some of our Green efforts and help our team achieve our next goals. Green Fins currently has over 400 members across 9 countries and is growing fast. These members who join for free consist of SCUBA diving centres or snorkel tour operators who have pledged to follow a set of standards to reduce their impact on the marine environment. 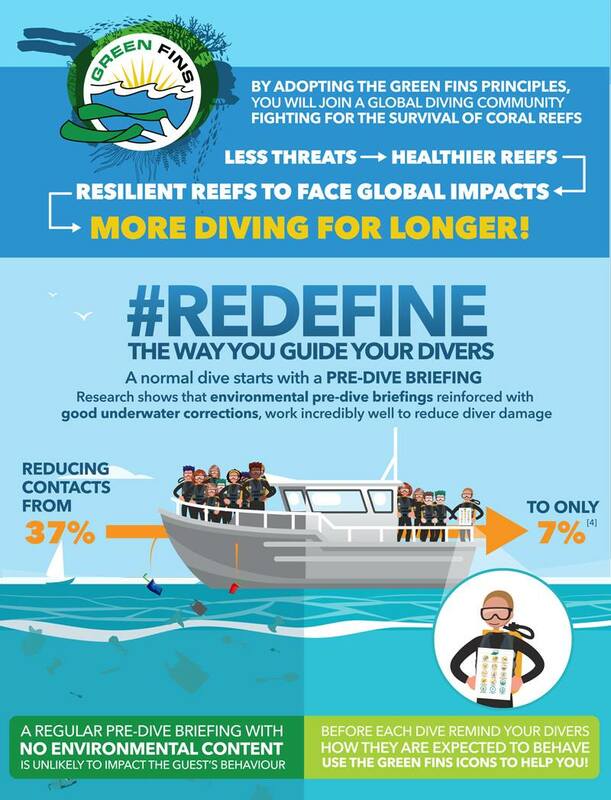 Diving and snorkelling centres are uniquely positioned to act within their own communities and among customers to encourage positive and lasting change. As recently revealed by the TripBarometer by TripAdvisor, the world’s largest accommodation and traveller survey, 79 percent of travellers place importance on properties implementing eco-friendly practices. The Green Fins approach is all about having a network of educated and committed businesses who are continually reducing their impact year on year. We are all Green Fins! To learn more about Green Fins, you can visit their website.